I learned a creative new use for blueberry plants during a visit to Costco this week. The latest shipment of plants was on display and included the usual ornamental shrubs, trees, and landscape perennials. 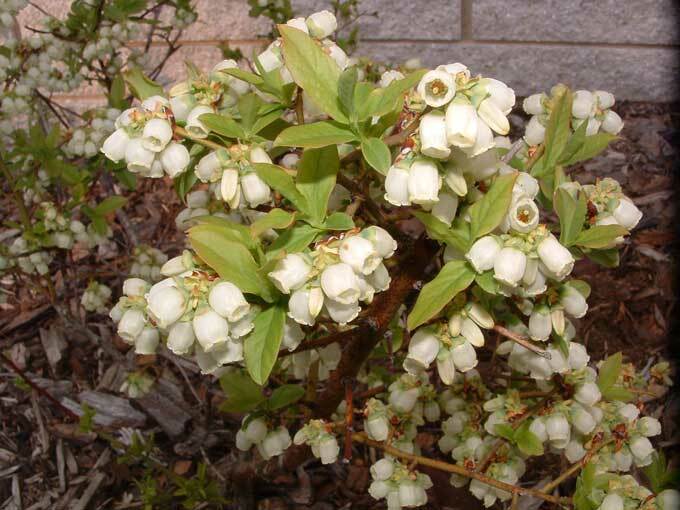 But of course the thing that caught my eye was the attractive blueberry bushes that were covered with those unusually shaped white flowers! That struck me as being pretty funny in one sense, but sad in another, and I could only picture her picking the ripe berries from her bushes and then tossing them against the side of her house. But even with that treatment it’s doubtful that her home would be discolored by the dark blue fruits. In fact my blueberry plants grow rather nicely right alongside the house and have functioned terrifically as ornamentals. Hundreds of bell shaped blossoms appear every spring and are followed by huge clusters of sweet blue berries in the summer months. For a showy fall display the leaves turn hues of brilliant red or gold, and even during winter the bare stems and bark add a unique tinge of color to the landscape. No, these blueberries will work just fine for me as a landscape plant that is not only attractive but also yields loads of nutritious and tasty fruit. And I have yet to notice a single stain from the berries. My only concern was which variety to choose as there was a wide selection that included; Duke, Reka, Northland, Chandler, Bluecrop, Jersey, Bluegold, and a few others. What am I going to do with them! Did she really just ask me that? Guess I could have responded that I was going to go home and stain the house! And you can dye your hair, Easter eggs, and clothes with blueberries. 🙂 I am wondering how the blueberries get on their house. Nice post! Blueberries would go well with other acid-loving plants — Azaleas, Rhododendrons, Heath and Heather. Lingonberry and Wild Blueberry are not only edible, but would make a nice groundcover as well. If you haven’t already, check out _Landscaping with Fruit_ by Lee Reich. Do you have trouble with birds eating your blueberries? I know blueberries are supposed to be very easy to grow, but I’ve read that there’s nothing birds like more. You’ve inspired me to get some blueberry plants. I’ve tried growing blueberries before and it was a fail. I will try again. Thanks for sharing and for the inspiration! Thanks Ben, I have a copy of the book and have attended a couple of workshops with Lee. Some seasons the birds are all over the blueberries before they even have a chance to ripen but usually I’ve been fortunate and they haven’t shown much interest in them. I do have them in a location that would be easy to cover with netting if necessary. I’ve had more of an issue with the rabbits pruning the bushes by nibbling off the new growth. Hi Evelyn, I think a big key is to amend the soil before planting to ensure that it offers the acidic pH that blueberries prefer. I did kind of give her a puzzled look when she asked me that question, but hey at least she was curious! That was a great read, thanks for sharing. I’m a newcomer to your blog but it seems like there is loads of good stuff here. I first arrived via an artical about goji berries. Hope yours are doing well. Anyways, I myself have picked up a duke and a bluecrop and will be trying my first go at container grown blueberries. When it comes to repotting do you happen to have a recommendation for soil mix? I know they like very acidic and very well draining but how to achieve that with potting soil is beyond me. Hi Jason, thanks for stopping by. I was out to Mike’s apiary just last weekend. Hope to see you at another event this summer! The blueberries that I just planted have lots of berries on them so I’ll see if they produce a harvest this summer. Hi Luke, thanks for visiting this site. For blueberries in a container I would go with a combination of a good potting mix and peat moss, then feed the blueberry with an acidic organic fertilizer as needed. Hi I was told by a pest control company not to plant next to my house because we didn’t know if the house had ever been treated for termites. If it had the poisons would go into the plants. Our house is 65 years old and we have lived here 15 years. So I don’t know if it was ever treated for termites. Have you ever heard of anything about this? I’m not sure about the termite treatment(hopefully someone else can chime in) but the other big no-no reason for planting up against or near a house is lead paint. Almost always an issue. 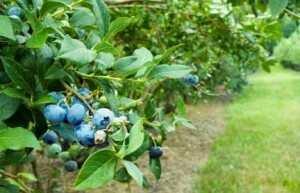 I heard that blueberry plants like to be planted close to each other, for pollination I suppose. I wonder if it would be ok to have two pots next to each other or can they be several metres apart? Hi Sandie, if there is a concern that you have toxic chemicals in the soil then I would not plant edible crops in that area. Not sure but maybe there is a lab that can test for contamination levels to provide you with some comfort as to whether or not it is safe to plant there. Hello Sarah, many blueberries will produce fruit without pollination from another variety, but they will be more productive and yield higher quality fruit when pollinated by another variety. I think that spacing your blueberry plants several meters apart would be fine and allow for adequate pollination. My blueberry bush has been growing in a container for three years and the crop of blueberries just keeps getting bigger and better – they are a tasty snack when I get fed up with the weeding! I found that sphagnum peat moss will amend soil before or after planting. I gently push some in the ground as well as around the plant/bush like mulch. I also put half a small bucket of sphagnum peat moss and fill with water; let sit for a few minutes and water the plant with it. I literally have a 2-3 foot radius of acidic soil around my blueberry bush. I’m a beginner in gardening and it may be a strange question to ask but I was wondering about using insecticide on my fruit plants. There was a time when the leaves of my strawberries were being eaten through by something that looked suspiciously like a centipede and there’ve been other times when slugs have gotten the better of my crops. And so this is my question. I welcome the attention of any curious bees – and any insect which helps pollinate for that matter – towards my plants but which insecticide would be best to use to prevent the unwanted admirers (i.e. slugs, caterpillars, worms, fruit flies, ants…the list could go on) getting close to them – and which part of the plant should I apply it to cause less irritation to butterflies and bees? …Should I be investing in a pesticide/insecticide in the first place…or are there other ways to protect my crops? Why have I never thought of planting blueberry plants in a container? Our garden is one the property where we are going to build a house, but we have not moved yet. I’d love to do a blueberry plant in a large container that I could take with me when I move! I live in zone ten where i was told nothing would grow. I was defiant and I tried almost every plant. Was able to grow adeniums, clematis, daylilies, akebia longracemosa, kiwi fruit vines, puya bertroniana, mucuna sempervirens, vigna caracalla, aristolochia gigantea, ferraria crispa, alliums and lots more successfully. I was mad about blueberries. I bought a plant from a source in the UK. If I remember correctly, it was a 2 year old sunshine blue which was sent to me via mail order. It flowered that very month and set 3 fruits. I got one of them while other two were taken away by birds. The plant couldn’t take summer heat and died. I’d like to try it again if you could tell me whether sharpblue blueberry will be more heat tolerant than sunshine blue? Should I try them again or just forget about growing them forever. Hi Adnan, I’m not familiar with the varieties that you mentioned but there are southern varieties of blueberries that may be more suitable for your climant. You could also try planting them in a location where they will get partial shade for a period of the day. Great idea! Why haven’t I thought of this sooner. Thanks for the great info! I will also try this out for my other plants. Hi, I planted a honey crisp applie tree in 2009, live in baltimore md, planted in good soil, half day direct sun, been growing fine, anybody have any idea when fruit will appear? I received a “care” sheet when I purchased my blueberry plants. In the sheet it says not to plant blueberry bushes against the house or near a roadway. I really want to plant them in a row about 3 feet in front of the house. Do you think that is too close or will be a problem? How far from the house should they be?? Thanks so much! Hi Stephanie, I have blueberries along the side of my house and they do fine there. Depending on the variety three feet should be good, mine are slightly closer than that and are not crowded but three to three and a half feet away from the house probably would have been better. I can not get behind the blueberries but in my case I really don’t need to. An advantage is that if I ever wanted to net the berries I could even suspend it from the house and use less netting.